I got the chance to try out this product from Physicians Formula. The moment I saw the packaging I was excited because it is soo pretty where it comes in a sleek black packaging. This series known as Physicians Formula Super BB #InstaReady. Well, you know how Instagram has taken the world of internet nowadays. Plus this also relate to how instant you can get ready for your daily makeup look. As for me, I'm the type of person who love light texture of base with high coverage and I think I can find it it this Physicians Formula Super BB #InstaReady especially their concealer. Let me start with the primer. It is describe as a mattifying primer that weightless and invisible coverage. Helps to preps skin before we apply any makeup and base. It have Broad Spectrum SPF 18. We all know the function of primer basically to blurs pores, fine lines and any imperfections before we apply foundation and concealer. The packaging is somehow different from any other primer packaging looks like. it have the wand applicator for you to get the product. I never try any primer with this kinda packaging before because mostly comes in a tube type. I find it a bit weird but interesting ! This is the wand I mention earlier. Let me just share what Physicians Formula claims where it is Hypoallergenic, Fragrance Free, Paraben Free, Gluten Free, Cruelty Free, Dermatologist Tested, Clinically Tested, InstaFilter Technology. Everything they mention practically relate with the science of selfie. I'm not sure how to really explain about the texture but I hope you can tell by the picture. It comes with high-tech formula that works to instantly mattify, blur, and visibly retexturize skin. Non-greasy and your skin still breathable. Primer also can help to make your makeup last longer. This primer safe to be wear by it owns or under makeup. On my first time trying this product, it does absorb quickly so you have to apply it quickly too. the texture glides easily on my skin that make the application go easier. At first i don't really like it because I find that my base not that smooth as I want. But I give it another try and still feel the same. maybe this primer does not suitable for my skin that sweat easily. My face get sweating easily that probably the reason this primer not working well with my skin but I bet it works wonder to skin that not sweating much. I read on some article claim that this BB Cream best for oily-skin type and I go hype about it and exicted to give it a try. This BB Cream is special compare to any other BB Cream out there because it have the technology that helps to re-balancing skin with dual-sphere particles that absorb oil but not moisture which it perfectly balanced skin for a smooth semi-matte finish. It also describe as a multi-tasking BB Cream where it can neutralizes skin tone imbalance, minimizes shine and visibly reduces pores. Which I think it is perfect for any skin type to use this BB cream. It contains SPF 30 that helps to protect your skin from a direct sunlight. I'm in a Light/Medium code and this shade match nicely with my skin tone where it does not to light or dark for me. Physicians Formula Beauty Balm BB Cream helps to instantly hide any imperfections on your skin and smoothing the appearance of fine lines. It is Hypoallergenic, Paraben Free, Gluten Free, Cruelty Free, Fragrance Free, Non-Comedogenic, Dermatologist Approved and Recommended as an Effective Broad Spectrum Sunscreen. This BB cream comes in a tube type packaging which I'm kinda like it because it is easy to bring along when travel because you don't have to worry it might broken. Not any that the packaging also looks glamorous in the black color with a shimmer printing to it. With a small amount is good enough to give a coverage to my skin. This BB cream featuring an InstaFilter Technology that proprietary blend of mattifying and pore balancing spherical beads. Not only that, color filter pigments and high-tech polymers that work together to instantly optimize light reflection, blur imperfections and visibly re-texturize skin, while protecting against UVA/UVB damage with SPF 30. This is what they claim which sound fascinating because we really need to give protection to our skin. The texture of Physicians Formula Super BB #InstaReady BB cream is lightweight that make the application smoother and it glides on the skin effortlessly. After application I can tell my skin look smooth and natural-looking coverage. The coverage is light to medium which good for daily wear. 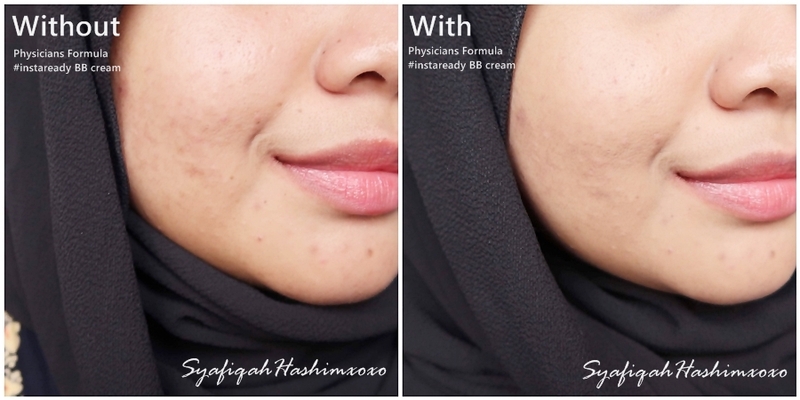 This is the comparison BEFORE and AFTER using Physician Formula Super BB #InstaReady BB Cream. Concealer time! If you follow me from the past year you probably know that I love concealer and I always happy to try new concealer. Physicians Formula Super BB #InstaReady Concealer seems promising. It comes in high-tech polymers that works together that instantly mattify, blur and visibily re-texturize skin. It also have Broad Spectrum SPF 30 that protect the skin against UVA/UVB damage. 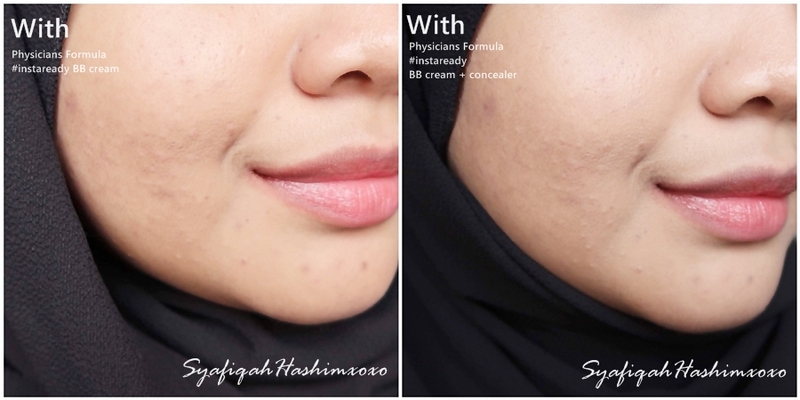 This is how the product will come out with one pump and I think it is enough for me as to cover the blemishes, dark spot and dark circle. Physicians Formula Super BB #InstaReady is Hypoallergenic, Fragrance Free, Paraben Free, Gluten Free, Cruelty Free, Dermatologist, Clinically Tested, and recommended as an Effective Broad Spectrum Sunscreen. It is safe for sensitive eyes and contact lens wearers. This concealer have creamy texture compare to the BB cream. The texture is more thicker and this make the concealer best for conceal dark circle and blemishes as it provides more coverage. Although it is creamy in texture but it lightweight. This concealer easy to apply but you must blend it properly so it does not look cakey or patchy. I love this concealer. I love the fact that I can wear it own its own when I;m not in a mood for foundation or BB cream but I still need something to cover up my blemishes. I like concealer when it can cover my dark circle nicely and not cakey. I normally will use brush to blend out the product than I damp with blending sponge to make it smooth and get the airbrushed looking finishing. I think it is worth to give this concealer a try and it does not have weird scent like the BB cream does. This stick blusher is a multi-tasking product where you get blusher and highlight in one glide. This stick blusher has InstaFilter Technology that help to properly blend the product on skin easily and keep it mattifying not too a cream finish. It also have color filter pigments and high-tech polumers that work together to get an instantly glow and contour your cheek at the same time. This stick blusher also have SPF 30 that can protect against UVA/UVB. This is how I normally use it. Glides it on my cheek and use finger to blend it out. I’m not a type of person who love creamy blusher because my skin type is only and I find that if I’m using cream blusher it will make my oily face appear even worst. But I give this Physicians Formula Cream Blusher a try anyway and I’m kinda like it! Because the finish of this cream blusher is not too creamy but it seems almost matte. Plus, it has the 3 layer which also include the highlighter that make my check look more define and slightly glowing at the same time. I probably think this stick blusher best for daily use.